A bright sunny day but it is a bit too cool to have breakfast outside at the friendly bar next door to the hotel. Le Suites sul Corso doesn't have a breakfast room but gives coupons underwriting breakfast at neighboring bars. The staff at Coco Loco are very friendly and one speaks excellent English. 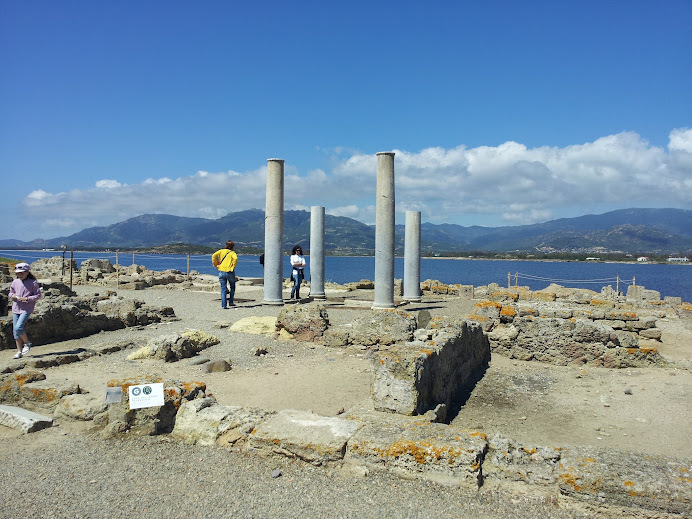 We get in the car and head west from Cagliari along the sea, enroute to Nora, the Phoenician/Punic/Roman city about 30 km from town. The beginning of the trip passes a lot of factories and shipping facilities. On the other side of the road is a big lagoon (stagno) where we see some light pink flamingos in the water. The main road to Pula is pretty fast after we escape the suburbs of Cagliari. Along the road, a few of the towns have decorations along the street and we see some flower petals and greens on the streets. 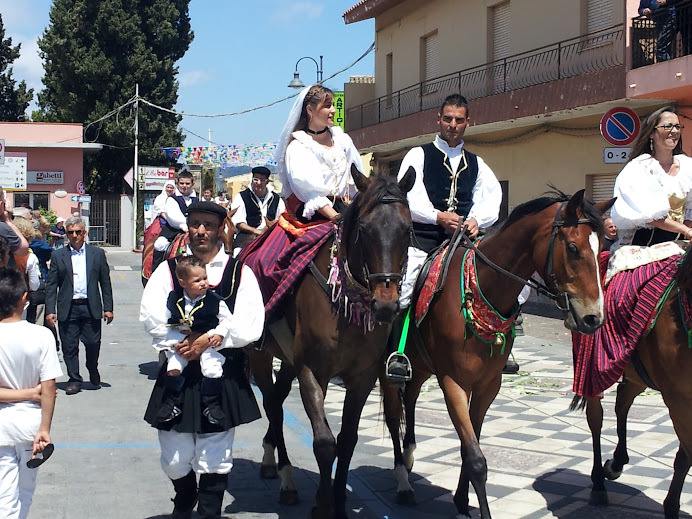 We are also following the route of the statue of Sant'Efisio to his home church at Nora and it is possible that we may meet up with the procession sometime during the day. 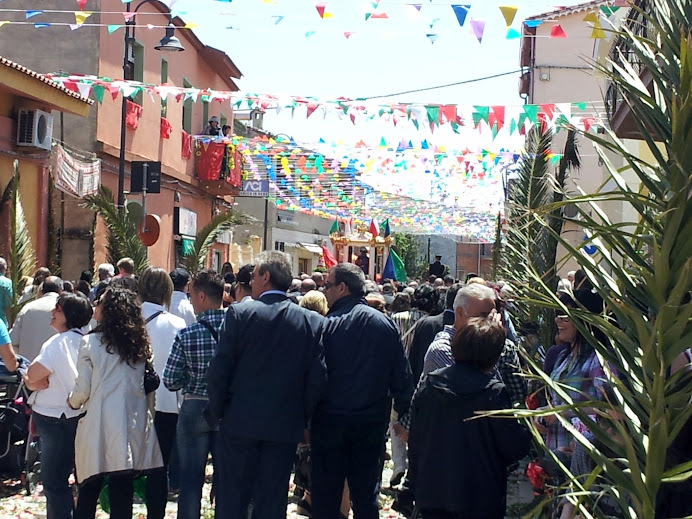 When we drive through Pula (the closest town to Nora), the streets are lined with flowers and banners and there are brightly colored pennants strung over the main street...so we may be able to see still another celebration. The archaelogical site at Nora is impressively sited at the end of a narrow peninsula with exposure to the water on three sides. Long, sandy beaches stretch out from the peninsula and people are swimming as the day warms up. 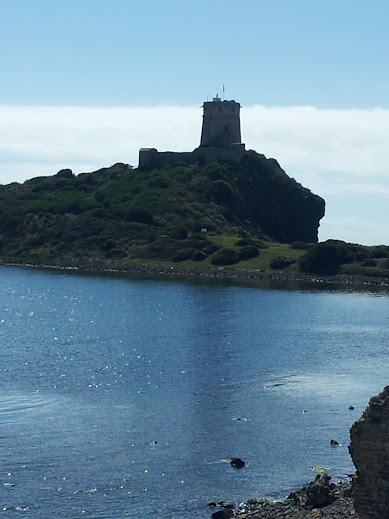 There is also a tower at the end of the peninsula...built by the Spanish in the 16th century. 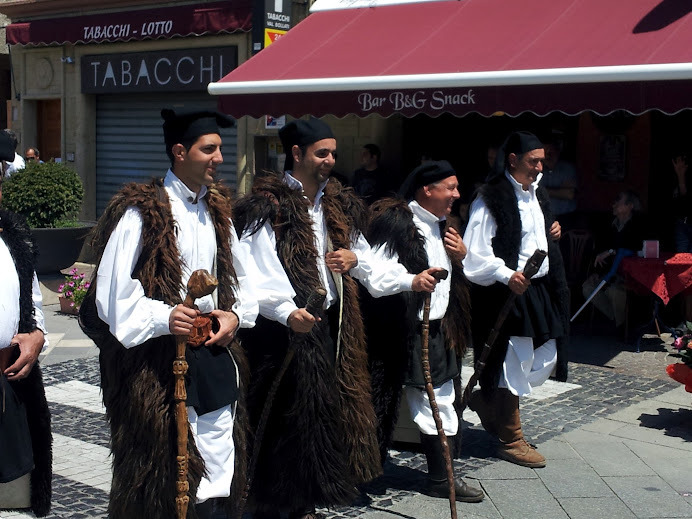 We ask at the ticket both about when the procession is scheduled to reach Pula and she tells us "around noon, more or less." So we may be able to make it. We are in a group with several Italians and a French mother and daughter. The guide gives us an audio guide in English so we can follow along but we find that we can do pretty well with a combination of Italian, French and occasional questions in English. The site is now almost all Roman...most traces of the previous inhabitants are gone. 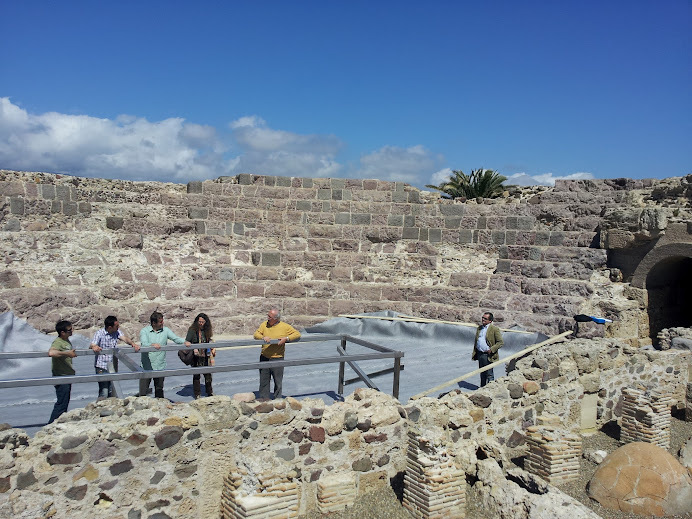 We walk around the Forum, the baths, through the residential districts and past the theater. There are some impressive columns still standing and some very nice mosaics....and on all sides, the beautiful Mediterranean. 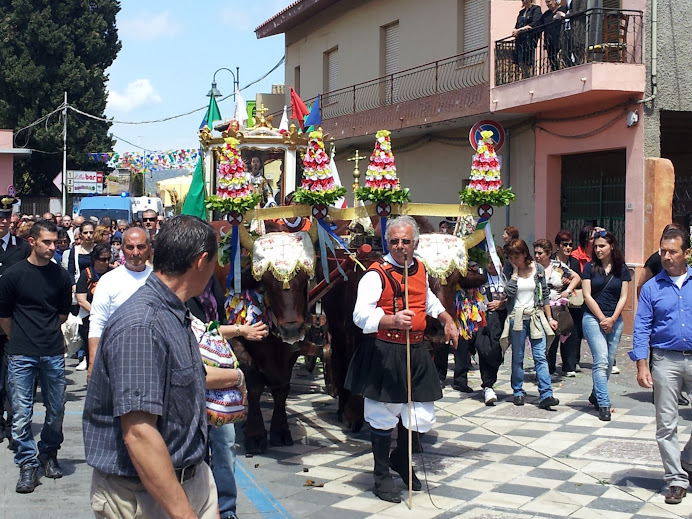 We hurry back to Pula to find out when the procession will arrive and where it will be. We find a parking space and I scout out a place to get lunch. We end up sitting outside at a bar across from the city hall and having a sandwich as the people begin to line the streets in anticipation. We talk with the old lady at the next table and the owner of the bar while we are waiting. Finally we hear some explosions from down the street which must signal the arrival of the statue. 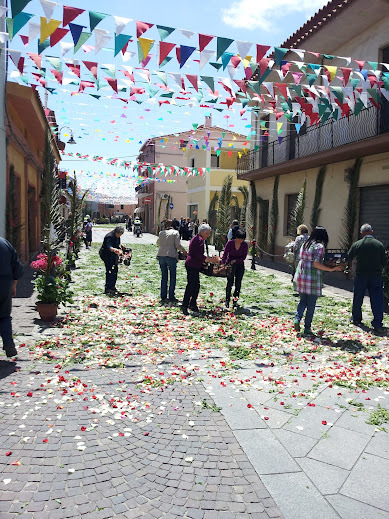 Men and women begin to scatter leaves and flower petals on the route. 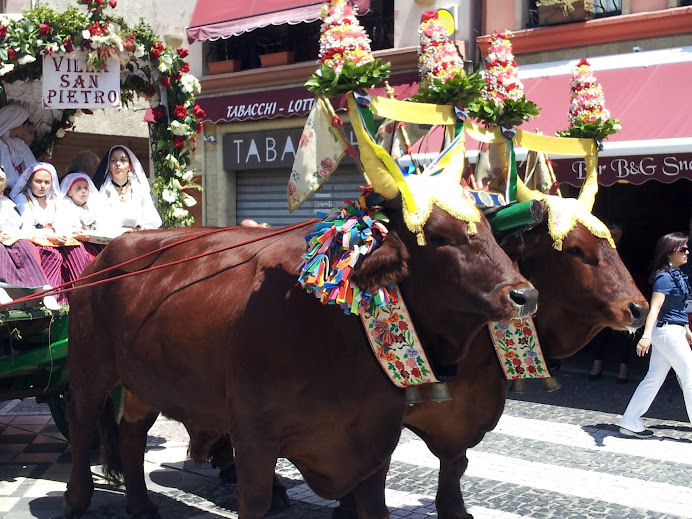 the town band, the confraternity in their robes, a church group chanting prayers, local dignitaries and finally, the carriage with the statue of Sant'Efisio pulled by two large oxen. Once the statue has passed, many in the crowd join the the procession. 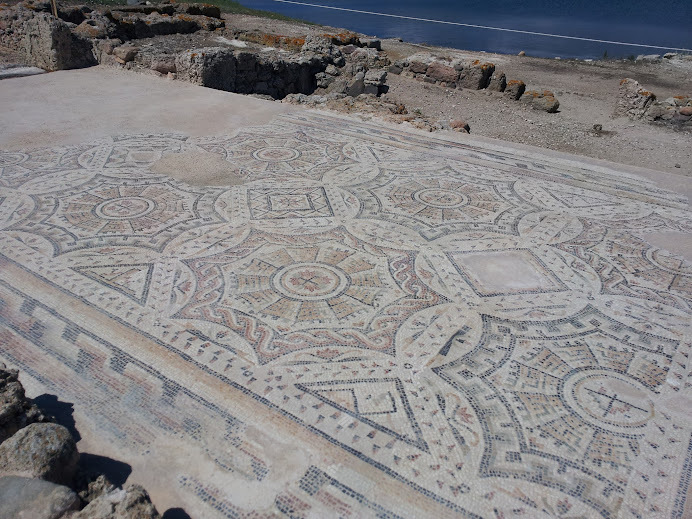 Before we leave town, we make a quick stop at the small archaelogical museum in Pula and then return to Cagliari driving on back roads...along the water and through some very pretty and very green hills. I do some scouting around for dinner places and we eat at a very nice restaurant (also just around the corner from the hotel) called Ristorante Flora. It looks fancier than most places that we frequent and the clientele are mostly very well-dressed older people (some older than us even.) But the staff is very welcoming and the food is very good....we share an order of delicious fried meatballs (apparently a local specialty). Diana has a dish of "malfatti"--basically a spinach and cheese filling without the pasta envelopes followed by nice steak with tarragon sauce. I have a spaghetti with clams and mussels (mussels are also a local specialty) which is great, followed by a whole fish cooked in a sauce with potatoes and tomatoes....also very good. The local red wine (a Carignano) is easy to drink. Diana has a seada...the ricotta cheese pastry topped with honey...which is good. I stop for a very good gelato at the gelateria on the same street...very nice straciatella and fior di latte. 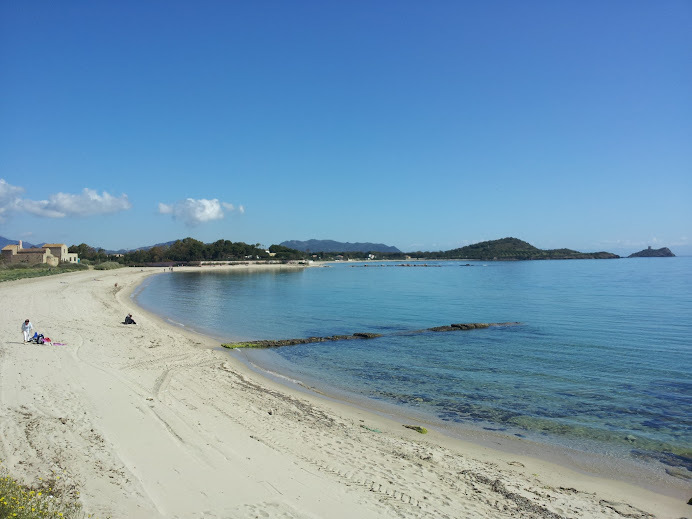 Tomorrow we plan to go to the archaeological museum in Cagliari.